The first question that a student has is – What is Qi? The problem is usually that the student has a notion of what they think Qi is, what it should do, and what it will do for them. Usually these preconceptions or belief about Qi are very convoluted and can range from notions that Qi is some mysterious force or that it gives the practitioner superpowers. This type of understanding does nothing to further the student's practice of Qigong, but instead will leave them confused and disappointed when they don't experience what they expect. 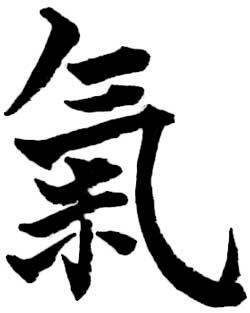 Traditional Chinese character for ch'i/qi. Lets start with the basics. The Chinese character for Qi is 氣 and it is pronounced "Chee," like the first part of the word cheese. Qi is not a mysterious force—even though we can not see it or measure it accurately with scientific equipment. The best translation for Qi is energy and it is everywhere. We have it in our bodies, it is in other living things, and all around us. If we feel energetic and full of energy, we can say that our Qi is strong and if we feel tired and run down, we can say that our Qi is weak. Understanding Qi can be that simple. If we are alive we have Qi, if our energy runs out, then we cease to live. Here is the bare bones of what you need to understand about Qi. When you are born you get what is called Prenatal Qi from your parents. You can think of this as your genetic makeup. This is the base material from which you have to work with in life. This can not be changed. This includes things like physical characteristics such as height, bone structure, the state of your organs (think about what is called genetic defects), etc. We also get what is sometimes called our constitution. This is the base from what you have to work with in life. After we are born we are nourished by what is called Postheaven Qi. Simply put, after we are born we get energy and nourishment from two main sources: the air we breath and the food we eat. The air we breath and the food we eat keeps us alive and healthy. These sources give us the nutrients and the building blocks that we need to repair ourselves and maintain our health and well being. So what this means is that we are born with a certain constitution and genetic makeup and throughout our life we can keep ourselves healthy and at our optimal state through three different things: diet, exercise, and lifestyle. All three of these things can either enhance our energy or deplete it. Qigong falls under the category of exercise. And if you notice, that is only one of the three. In other words Qigong can be a big part of keeping yourself healthy and functioning at an optimal state but it is only part of the picture. Other parts of your life are also important—namely diet and lifestyle. The practice of Qigong helps to keep the energy in the body flowing freely so that every part of the body can get the energy and the nutrients that it needs to maintain itself, repair, and grow stronger. 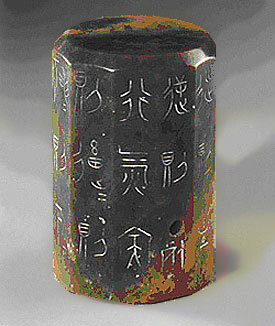 Xing Qi Ming, an artifact from the late Warring States Period, is the earliest found written evidence of Qigong theory and practice. Displayed at the Tianjin Museum. In the body, Chinese Medicine classifies all different types of Qi or energy. Usually the classification is based on what the energy is doing. If the energy is performing a function in a certain organ, then it is classified as the Qi or energy of that organ. So there are many different classifications or types of Qi in the body because every aspect of our physical body, the muscles, tendons, ligaments, glands, organs, etc. all have a function, do something, or have energy. In addition our thoughts, mind, and emotions also have energy, do something, or have a function. So all in all that is a lot of different "types" of Qi that can be differentiated and classified. But it really is the function of energy that is being classified. In reality, energy is energy, it is all the same but it has many different functions. In other words, Chinese Medicine classifies many different "types" of Qi but these are not different "things" that can be put into a box and labeled, like here is a box of Qi A and here is a box of Qi B, it is just a classification of the function of different aspects of the body. The reason Chinese Medicine is so detailed in its exploration and categorization of the body is because the goal of Chinese Medicine is to cure disease. There has to be a frame work from which to work from when getting the body to heal itself from disease and disharmony. If a part is not functioning properly, then the goal is to bring that part back to the way it needs to function for the entire system (body) to function at its optimal state. This type of understanding of the body is also used in what is called Medical Qigong, which is a part of Chinese Medicine. For a regular practitioner of Qigong, the Chinese medical understanding of Qi and how the body functions is a little beyond what you need to know. Actually, you can benefit from Qigong without knowing anything at all about the theory. All you have to do is practice the exercises. Very simple right? But yet many people will make it overly complicated. In the body the function of energy or Qi can be divided into six different categories. Lets briefly introduce these categories. Energy or Qi in the body is responsible for carrying out transformational processes. In Chinese Medicine these processes include: the Spleen transforming the food we eat into the material that is utilized to nourish and repair the body, the Kidneys transform fluids, the Bladder transforms urine, the Heart transforms raw materials into blood. In a western sense we can look at any metabolic process as an act of transformation. Transformation takes place all over the body and it is one reason why Qi or energy is important. Energy or Qi is responsible for transportation. In Chinese Medicine some of the different classifications of transportation include: the transportation of vital substances, the transportation of fluids, and the transportation of energy. Different organs play their role and the Qi of the organ is what carries out the role. Energy or Qi is responsible for holding. The Heart holds the blood in the blood vessels, the Kidney and Bladder hold the urine, and the Lungs hold the sweat. With a larger perspective we can understand that the body is made of many membranes and tissue, some of them large and going down in size to the individual cell walls. All of these structures depend on energy or Qi to maintain their integrity. Energy or Qi is responsible for raising. This is important because one of the main natural forces that we encounter at every second is the force of gravity. The Spleen is responsible for raising the organs and the Kidneys send energy upwards. Energy or Qi is also responsible for protecting the body from external pathogens. This protective function is governed by the Lungs. Think about how when you are tired and run down (lacking energy) you are more susceptible to catching a cold. Strong energy can protect the body from colds and other environmental factors that can damage the health. Energy or Qi is responsible for warming the body. In fact many of the processes in the body either depend on heat or produce heat. This is all a function of the body's energy. You will notice that these processes or functions of Qi are all concrete physiological things. They are based in the real world and how the body functions. Now some of the explanations do not follow the western paradigm, but they do describe physical aspects and functions of the body. Practicing Qigong can strengthen the Qi and by doing so it strengthens the body's functions. This entry, used with the author's permission, originally appeared at spiritdragoninstitute.com. Slight changes were made in accordance with the style formats used in Qi-Encyclopedia.